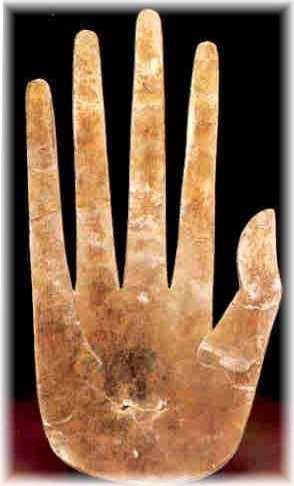 One of the most common symbols in rock art, and yet one of the least understood, is that of the hand. Our lack of understanding is probably due to the complexity of this universal symbol. To understand the reason for the diversity of meanings, we have to go back to the basics. What is the hand? Primarily, it is a tool, and an extremely useful one, thanks to our opposable thumbs. Our thumbs are those clever digits that allow us as humans to have jobs, use credit cards and operate computers, while our nearest living relatives hang out in trees and eat bananas. The second use of the hand is for communication, and this use has been around as long as Man has had language. The use of hand in language may have begun with simple, basic universal gestures, understood by everyone: �Stop!� �Come here.� �Go Away!� This simple signals eventually evolved into the very useful form of communication ,the first sign language, used by nomadic groups to communicate with strangers that they encountered on their travels. Use of sign language was nearly universal among so-called �primitive people� and was almost certainly used by the early migrants to this continent. By the time of the Maya, hand signing had evolved into a rich, complex form of communication , seen on wall murals, decorated vases and in sculpture. These hand signs need to be taken into account when deciphering Maya glyphs, as this imagery is a supplement to the written language of glyphs. The success of the early Maya was based upon trading, and this form of communication must have been essential when visiting the scattered city-states, and the outlying communities on their trade routes. 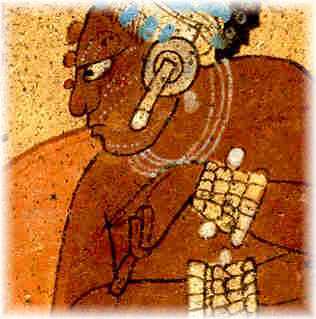 The Maya hand symbols eventually spread far and wide through the visits of the Pochteca traders, and were eventually adopted and greatly amplified upon by the Plains Indians, who had an intertribal hand sign system of over 100,000 signs. Is there a clear connection between Maya and Plains Indian hand signs and Southwestern Rock Art? Well, yes and no. As important as the intricate language of hand signing may be, it is still not the complete answer. While we do see some clear examples of the use of hand signing in rock art, there are still many other uses and meanings to discover. For example, as with the Maya hand symbology, the exact meaning is highly dependent upon context. 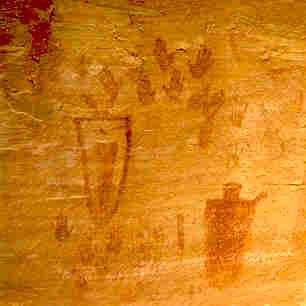 If hand symbols are used as part of a rock art panel, then the meaning of the entire message must be determined by looking at the other symbols on the panel and how they relate to one another, in order to clarify the meaning.